Sony's next-generation NEX-5N looks pretty much the same as its immediate predecessor, the intriguing NEX-5A, but there the similarities end. The NEX-5N is in many ways the realization of the potential that the 5A could only hint at. The camera is capable of simply staggering image quality, no longer approaching DSLR quality but rather vaulting to the very top of the DSLR cohort. Yes, there remain some quirks and limitations to be aware of, but these will be of little significance in most shooting situations. What is the 5N? It's a mirrorless camera built with a DSLR-sized sensor (in the APS-C, or crop format). You might best describe it as a sensor and a lens. The lens is interchangeable, opening up both creative possibilities as well as access to high-quality glass the likes of which compact shooters could previously only dream of. For backcountry purposes, the big deal here is the NEX-5N's extremely light weight and compact size. I admit the NEX's dimensions (approximately 4.5" x 2.375" x 2.5" w/16mm lens) aren't quite in the fit-in-your-pocket category—but they're close. Once and for all, the NEX-5N settles the awful question as to whether you should bring your DSLR (for quality) or your compact (for size) with you when you climb. 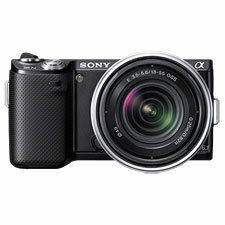 Sony has introduced two cameras in the NEX's 'enthusiast' series. Along with the NEX-5N comes the NEX-7K, with a whopping 24MP sensor plus a gorgeous organic-LED viewfinder. I say stick with the 5N; you can get the viewfinder as an accessory if you really want it, and the 5N's 16MP offers abundant resolution for a crop-sensor plus superior low-light imaging, in a slightly more compact and lighter body, at a significantly lower cost. What's not so good? Menu navigation remains quirky, with key functions often buried deep within menus. Physical controls on the camera body are limited. You'll need to learn how to adjust the camera (when not in an auto mode) using menus and virtual controls. I say the NEX cameras are currently under-served when it comes to good lens choices, although Zeiss has a few new models in the works, so that will change with time. Your DSLR will remain needed for timelapse photography, and some—but not all!—fast-action capture. As I continue to get to know the NEX-5N, I find it comparing favorably with my Nikon D7000 in a wider range of situations than I expected. For me, at least, the 5N is getting dangerously close to a D7000-killer. Special mention must also be made of the NEX-5N's video capability. The 5N shoots 1920x1080-60P video at 28MBPs using the AVCHD 2.0 spec. Video is markedly better than my D7000's, with the added bonus of credible autofocus capability. With the 18-55mm lens you also get a decent image stabilizer option. The only liability with regard to video is the lack of an external mic jack. Sony makes an optional stereo accessory mic, but this is a big negative for more serious video production.